I’m a little late getting this out but better late than ever. I’ll try and have a yearly review out shortly. 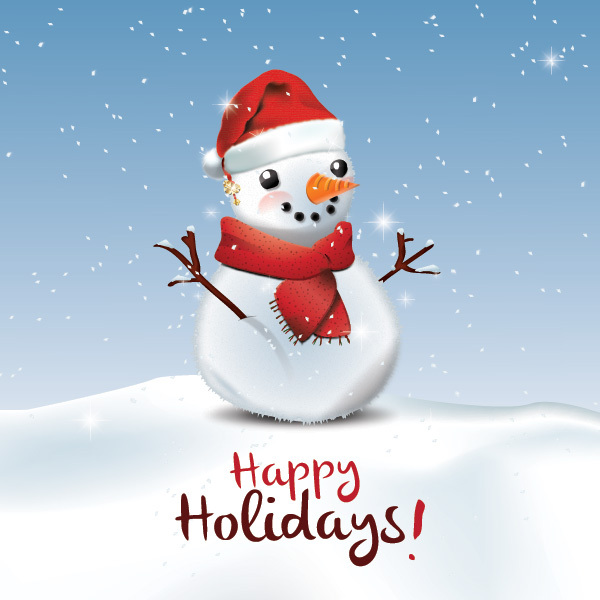 I hope everyone had a great holidays and a happy new year! The only options activity I had was getting 200 shares of BBVA assigned which brought them up to near a full weight. I have 12 short put options that are open as of the end of the month. I earned $1561.00 in dividends for the month. This is an increase of 45% from the same month last year. My total year-to-date dividend income is $10,345.03. This surpassed my goal of $10,000 in dividends for the year. 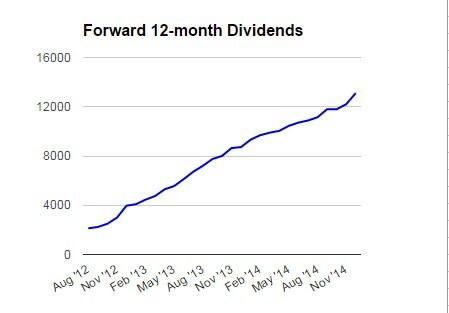 My expected forward 12-month dividend income has increased to $13,107 from $12,204.92, a 7.4% increase since last month. 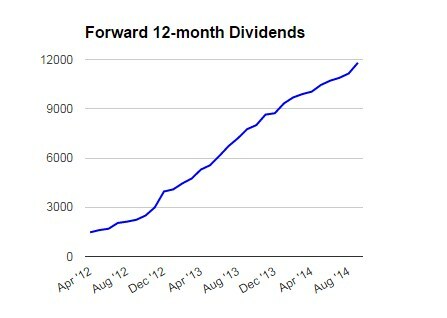 I’ve had 34 companies increase dividends so far this year. I do have some goals met to add to my list including over 10k in dividends for 2014. I’ll be sure and come up with a 2014 goals update post and follow that up with a goals for 2015 post. One rental had a spring break on the garage, the fix was about $300. No other news but I’m thinking of selling one of my rentals in the first quarter and rolling the funds into possibly two more. I’ll be coming up with a solar update for the year so you guys know how my production production went. I’m still at $802k, no change from last month. Even with the large contribution I made, the retreat in shares of oil companies have made my portfolio take a little bit of a hit. I hope to have a positive increase next month. I did meet my goal of $800k in net worth for 2014. No notable articles posted this month. I hope to start writing more in 2015. I’ve met some but not all of my goals for 2014 and will be following up with an update on all of those plus a full year update. 2015 should be an awesome year. I’m debating now on whether I should start building a larger cash position to purchase a rental earlier in the year and see what happens with the stock market. Something tells me that oil prices will be quite low for the first half of the year. I’m already heavily exposed in energy so I’ll likely target buying another property earlier rather than later. Over $1500 in dividend income is awesome. I’m still working on my next big milestone of averaging $1k a month in dividends. While it may be a few years away I see the progress with each passing year and see myself getting closer and closer. Do you plan to keep investing heavily each month or will your fresh capital taper off a bit? Thanks for sharing. A very nice month and what a year! I’ve been reading your blog for some time now and have to admit that the fact that you are able to invest such an amount of capital each month is just awesome. I’m really looking forward to reading more about your investment plans for this year. Best of luck for 2015! Wow! Fantastic job, AAI. Congrats on putting that capital to work and increasing your dividend income going forward even though you are raking it in with $1500 a month. Wow 14k in new capital is awesome! Congrats on passing 13k in forward dividends and receiving over $1500 in December dividends. Those are amazing accomplishments. Wow that’s fantastic! 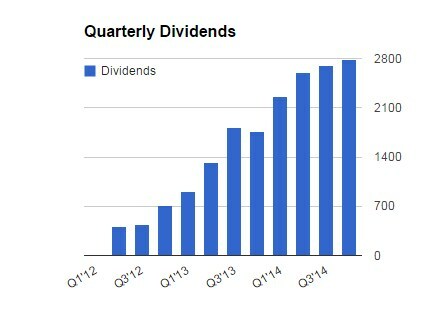 $14k in new capital invested into dividend paying stocks will pay “dividend” in the long run. 😉 These numbers look amazing! Great results for December and for 2014! Keep up the good work! Looking forward to your 2015 goals post and seeing how you progress this year. Awesome job. Thats a lot of purchases for the month. Bet those BBL shares will look like a bargain in the near future! Wow 14k invested. That’s about an entire year for me! Looks like you picked up some solid names as well, although I’m a bit surprised with the JNJ buy at these levels. Keep up the great work. I like the energy stock build up you have going. Oil stocks will be volatile this year, but history has proven them to bounce back and be winners. Best of investing luck in 2015. Happy New Year! Congrats on a solid year of contributions. I like TD & BBVA a lot, but I’ll be happy when the bleeding stops. I’m sure it is only temporary, but no fun nonetheless. Take care. Jealous of your dividend income! Wow. With $342/yr of income why mess with the options? That is some big purchases! Somehow I am more interested in your solar update lol. I love savings like this. I have converted my home to leds and a rental property all to leds now too thanks to u! Wow! You’ve got some fine purchases going on! I’m struggling to invest that amount all in a couple of months. Looking forward to more posts this year (and updates).